To help us with our organization needs in our laundry room. My wife requested a shaker style peg rack in order to hang items up off the floor. She was looking for something that could handle beach towels, umbrellas, a purse, and the odd jacket for the 6 or 7 weeks out of the year that jackets may be needed. The shaker peg rail was a utilitarian design meant to hold several layers of outdoor clothing easily and simply. Shakers were extremely dedicated to honest hard work and perfection and this is reflected in a unique form of architecture, furniture, and handicraft syles. Believing that making something well was in itself an act of prayer, many of their products were made with care and quality to stand the test of time. They rarely fashioned items with elaborate detailing, extra decoration and frills. They focused on making items for their intended uses. The were formally called the United Society of Believers. They were formed in 18th-century England when dissidents from various religionns, including the English Quakers and Methodists, formed a religious society based on prophetic doctrine. They were known as Shaking Quakers because of their use of ecstatic dance in worship. The Shakers emigrated to the United States in 1774 and eventually established nineteen self-contained communities from Maine to Kentucky. One of the most prominent was the Canterbury Shaker village that was formed by Mother Ann Lee in Canterbury, NH. If that isn't enough, then you can click here for more Shaker info. 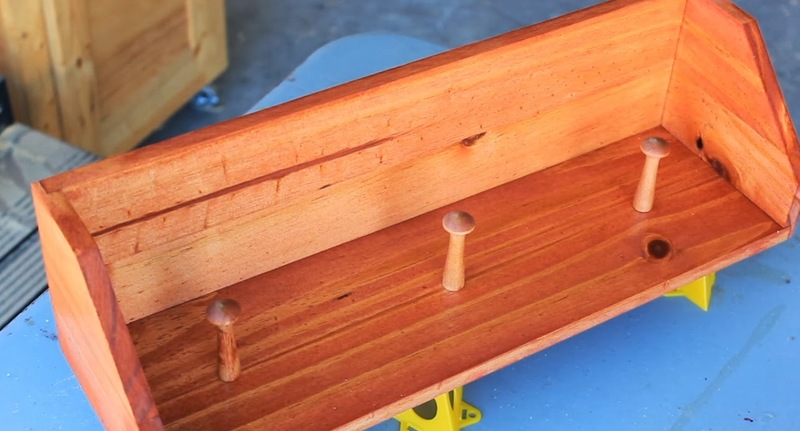 As I mention in the video, the wood is upcycled material from an old bed frame someone was getting rid of. However, the pegs were these Shaker Pegs . If you decide to purchase shaker pegs and you do it thru this link, you help support my family and the content we produce. Your help would be greatly appreciated. I always enjoy hearing from subscribers and readers like yourself so if you have questions or comments you can leave those here or on a specific video on youtube. Speaking of youtube don't forget to stop by my channel to like and subscribe if you haven't already. Until next time, happy DIY'ing.